Solution Saddles Customer Stories: Denise Ward found her SMART saddle to be absolutely crucial in the rehabilitation of her horse Jack. Denise Ward found her SMART saddle to be absolutely crucial in the rehabilitation of her horse Jack. “Jack’s resistance to schooling seemed impossible to solve. He came to me with a sore back from an ill-fitting jump saddle, but even after the soreness was treated with extensive physiotherapy and having my saddle re-fitted to him, he was resisting any schooling as if he was still uncomfortable. I am not a high level rider, just someone who loves my horse and tries to ride in the best way I can. It was incredibly upsetting that I could not find the key to what was wrong. I could not make sense of it and tried everything- including having him scoped for ulcers. I never thought that his saddle could be the problem as it had been properly fitted to him and did not cause rubs or any other visible problems. At one point, I had tried a different saddle, but it had made little difference. The Solution Saddles Approved Advisor came with a SMART saddle for me to try and at the same time, was able to identify areas on Jack which had been damaged by the previous saddle - this made Jack’s discomfort schooling in a treed saddle totally explicable. It was not possible to put everything right in five minutes as Jack has needed to learn to stretch and strengthen his muscles in areas of atrophy. He has taken a bit of time to trust the different feeling of the SMART saddle on his back, but as soon as I sit on him I am aware that he is comfortable and of the difference in the way he moves. 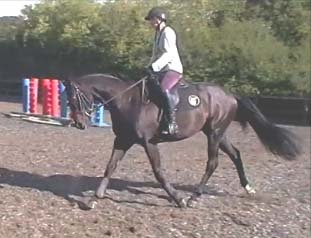 Other people at my yard have commented that he looks a different horse in the school … a happy one, at last! Both my instructor and my Approved Advisor advised me to get Jack's back X-rayed, which revealed that two vertebrae behind the saddle area, although not touching, were very close, with one showing signs of abrasion. This has clearly been the source of his problems, no doubt arising from working slightly concave because of the treed saddle issues. At times, this still makes him uncomfortable and unwilling to work ‘round’, even though he is so much more comfortable in the new SMART saddle. My Vet has advised that training him to stretch and work his back will ameliorate this and the new SMART saddle makes this possible. She also suggested anti-inflammatory injections into the area to help get this going. The ability to easily adjust the fit and balance of the SMART saddle for both me and Jack by simply adding shims where needed can help us through this rehabilitation period. I felt a difference with the SMART saddle right away. I am confident now of his comfort schooling and the horrible memory of him sticking his head in the air and absolutely refusing to go forward to the point where he would threaten to buck me off is fading fast. It feels like quite an achievement as his temperament and the state of his back has meant some persistence with different strategies of exercise and using nutrients to help him. I am absolutely sure that the SMART saddle has been crucial to this as it has allowed everything to work. I will never put a treed saddle on him again, so am hacking in my new SMART PRO Dressage saddle - maybe one day will be in a position to get a SMART GP as well!